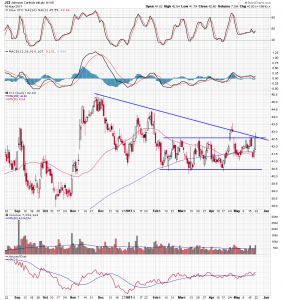 Citigroup (c) continues to outperform relative to its money center banking peers and now is preparing to breakout out of a triangle pattern on its daily chart. 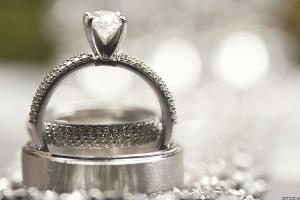 Here’s a link to the article published on TheStreet.com this morning. Darling Ingredients (DAR) is a rendering company that sells natural feed and food ingredients, as well as organic fertilizers and biofuels. The stock has a history of making large percentage declines in relatively short periods of time. In 2008, it lost nearly 83% of the share value but recovered that and more over the next two years. Then in 2011, the stock price dropped 39%, and after another two year recovery, it fell over 66% from its 2013 high to its 2016 low. Since early last year, it has been able to retrace 50% the previous loss, in the process forming a large cup and handle pattern on the weekly chart and now looking like it is ready to break above rim line resistance, and make another attempt at a recovering the old highs. On the daily time frame, the stock can be seen bouncing off its February low this year which marked the handle low of the weekly pattern, and then gapping higher in March. It traded in a horizontal channel for the rest of the month, before breaking above pattern resistance in April and moving on this month to retest the weekly cup and handle rim line. The stochastic oscillator reflects the positive momentum that followed the recent bounce off the 50 day moving average, and the Chandre Trend Meter reading, which identifies trend strength using multiple indicators on multiple timeframes, suggests the stock is a strong uptrend. 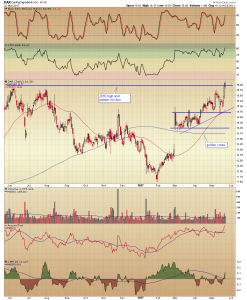 Chaikin money flow has crossed above its signal average and into positive territory and supports recent price action and the potential for a breakout. The stock is a long candidate after an upper candle close above the $16.00 rim line level using a trailing percentage stop. A break above this weekly cup and handle resistance line projects a pattern price objective that targets the former all-time 2013 highs, and would complete another process of deep pullback and recovery. 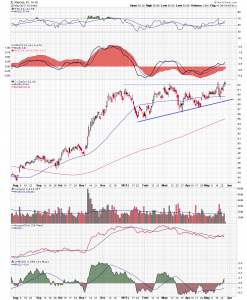 Three names in the auto parts space have been undergoing price consolidation on their daily charts, after several months of declining price action, and technical indications now suggest they are preparing to break above pattern resistance. The moves are accompanied by improving volume and positive money flow which has the potential to reverse the previous downtrends and accelerate their price higher. 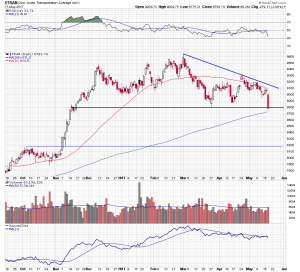 Shares of Advance Auto Parts (AAP) broke down through an intersection of support in the $169.00 area and its 50 day moving average earlier this year, and then began trending steadily lower. 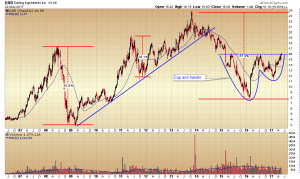 In April they began a basing process and have formed a rounded bottom on the daily chart. Last week an intersection of resistance at $148.00 level and the declining 50 day moving average was broken decisively to the upside. Daily moving average convergence/divergence is overlaid on a weekly histogram of the oscillator, and is moving above its center line on both timeframes, and the relative strength index is tracking higher above a rising 21 period moving average. Overall volume has picked up and Chaikin money flow suggests that the stock has been under accumulation during the second half of the consolidation. AAP is a long candidate at its current level using an initial percentage stop under the resistance-turned-support line. A lateral channel consolidation has been underway on the daily chart of Johnson Controls (JCI) over the last four months. The continued compression in the price has moderated the momentum indicators and, while overall volume has improved, the accumulation/distribution line has been oscillating around a flat signal average. This month the converging 50 and 200 day moving averages have supplied support in the upper half of the channel range, and in Friday’s session the stock was up nearly 2% and closed at channel resistance. It is a buy after an upper candle close that takes out the intersecting down trend line and horizontal resistance line, using a position size that accommodates an initial stop under the nexus of moving average support. 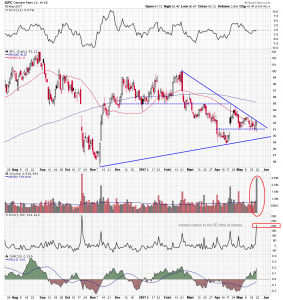 On the Genuine Parts (GPC) daily chart, the stock price can be seen consolidating over the last month in a small triangle pattern within a complex of larger consolidation patterns. A hammer candle formed in Friday’s session above support in the $91.00 area and below the intermediate term down trend line and the declining 50 day moving average. This retest of resistance was powered by a spike in volume 200% greater than the 50 day moving average of volume, equivalent to or greater than the volume that accompanied the October 2016 drop and the rally that followed in November that year. GPC is a long candidate after another candle close that takes out resistance using an initial percentage stop under the $91.00 support line. 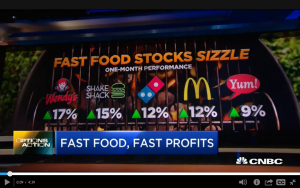 Chart Master Carter Worth “draws the lines” on the McDonalds (MCD) chart on Options Action and says it is time to take profits. There are a number of symmetries that suggest MCD is at an inflection point, and the percentage differences between recent closing prices and the 50 and 200 day moving averages are the highest they’ve been in the history of the stock. The markets were down sharply in Tuesday’s session and registered their largest single day decline since September, while the Volatility Index (VIX) spiked up over 46% and closed on the high of the session. The moves reminded us that investor sentiment is driven by more than fundamental analytics and technical indications. The dynamics behind it are primal and include fear and greed. As the markets move forward in whatever direction these visceral forces take them, here are several charts with support levels to monitor. The one major market average to keep particular eye on is the Russell 2000 SmallCap Index (RUT), because it began to flatten out ahead of the other indices and has established a well-tested level of support in the 1345 area. A breach of this level would likely return the RUT to its 2016 high, an important technical and psychological level, and further pressure the border market averages. The Dow Jones Transportation Average has been trading in a triangle pattern for the last three months under a declining 50 day moving average. Today it made its lowest closing low since November 2016, and broke through the triangle support line, and there is little in the way of further technical support until the 8200 level. It is not likely the industrial sector will continue lower for bounce higher without participation from the transports. The PowerShares DB US Dollar Index Bullish Fund (UUP) has been making a series of lower highs and lower lows since the beginning of the year. Today’s nearly 1.7% decline saw it break through a reinforced zone of support and close on its low. 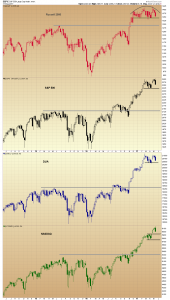 Moving average convergence/divergence made a bearish cross over in January and Chaikin money flow moved into negative territory the following month. Fibonacci retracement levels drawn off the 2016 range have provided some support along the way, and hopefully the 62% level in the $25.07 area will help to stabilize the downward trajectory. An eveningstar pattern formed on the weekly chart of the SPDR Gold Shares ETF (GLD), just below the 50% retracement level of its July 2016 high and the following December low. The eveningstar represents a transition in investor sentiment from bearishness to bullishness, but it must be remembered that, at this point in time, the bullish large white candle is not fully matured, and will not be until this Friday’s close. Chaikin money flow entered positive territory last month and the aroon indicator, which identifies early shifts in trend, has made a positive crossover. 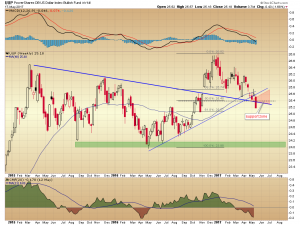 The ability of the fund to recapture the 50% interest level and base above it, could determine the intermediate term trend in gold. 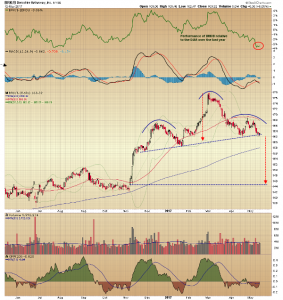 A head and shoulders top began forming on the weekly chart of the Financial Sector Select SPDR Fund (XLF) early this year, and the sharp decline in Wednesday’s session took the fund price back down to neckline support in the $23.00 area. As the second phase of the pattern has progressed the relative strength index has been tracking lower and below its 21 period average, and the accumulation/distribution line crossed under its signal average. The integrity of pattern support will determine if the price action this year is part of consolidation process that eventually leads to a return to the previous uptrend, or it marks an important top and the fund is preparing to make a measured move back down to its 2016 highs. 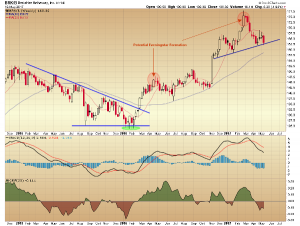 A set of technical patterns that have formed on the Berkshire Hathaway (B) chart could be signaling a major top is in place. On the weekly chart, the March high this year formed an eveningstar pattern similar to the one that marked the April 2016 top. An eveningstar is a three-period pattern consisting of a large white candle, followed by a narrow-range opening and closing doji candle, and completed by a large dark candle, and it represents a transition in investor sentiment from bullishness to bearishness. The eveningstar, also, delineated the head of a large head-and-shoulders consolidation above a rising neckline, which has been under construction since the beginning of the year. Moving average convergence/divergence has made a bearish crossover and is tracking lower, and Chaikin money flow moved into negative territory last month. 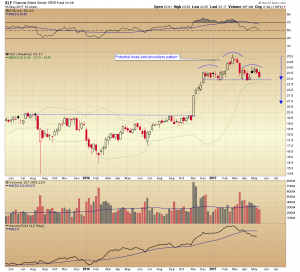 The price action in last week’s trading formed another large dark candle that closed near its low and on the neckline. That support is under pressure and the price momentum and money flow indications suggest it is ready to give way. At the top of the daily chart is a graph of the performance of the stock relative to that of the Dow Jones Industrial Average, and it has underperformed the index by 3% over the past year. 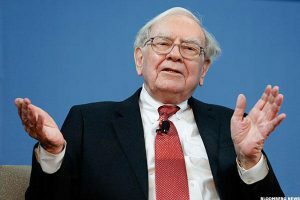 The recent performance of Berkshire shares relative to the major market indices may be the reason why Warren Buffett is a fan of index funds. The head and shoulders can be seen in more detail on the daily timeframe, with the right shoulder forming over the past month just below the 50-day moving average and above the pattern neckline. The integrity of the neckline looks in jeopardy, and a confirmed breakdown projects a price objective measured by taking the height of pattern and subtracting it from the breakdown point. 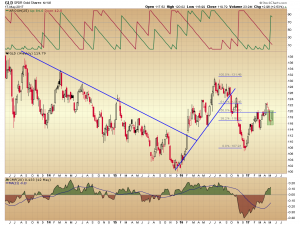 It targets the $145.00 area which would effectively wipe out the gain off the November 2016 rally. Moving averages help to identify trends on different time frames, filter our short-term noise, and can act as support for resistance. They are a great technical tool. When two key moving averages come together the zone around them takes on increased technical significance. The intersection of the 50-day and 200-day moving averages is an example. The following three stocks have broken above this confluence of moving averages and are poised to rally off their reinforced support. 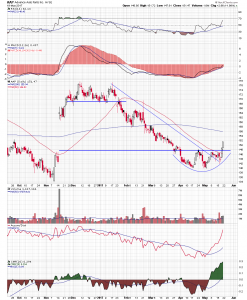 Carmax KMX is forming a cup and handle pattern on its daily chart with rim line resistance in the $60.50 area, just above the converging 50 and 200 day moving averages. Daily moving average convergence/divergence which is overlaid on a weekly histogram of the oscillator has made a bullish crossover and is trending higher on both timeframes, and the aroon indicator, designed to identify early shifts in trend, is making a bullish crossover. Chaikin money flow crossed into positive territory this month and the accumulation/distribution line moved above its signal average. 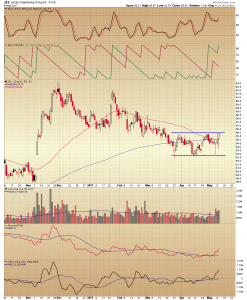 The stock looks poised to break out and is a long candidate after an upper candle close above rim line resistance. 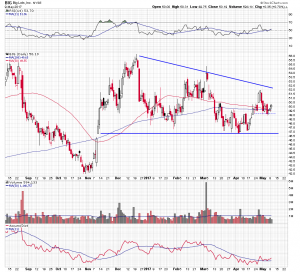 Shares of Big Lots BIG have making a series of lower highs above horizontal support in the $47.00, forming a wide range triangle pattern in the process, and price is positioned just above the converging 50 and 200 and moving averages. The relative strength index has been trending higher and is above its centerline and the accumulation/distribution line has moved above its signal average. These are complementary indications of positive price momentum and money flow. 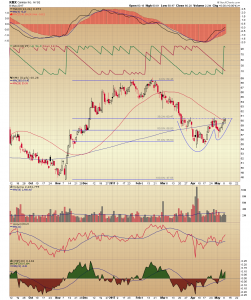 The stock is a buy at its current level using an initial stock under the $49.00 area. Shares of Jacobs Engineering Group JEC have been trading in a horizontal channel pattern for the last two months, and a large hammer candle formed in Tuesday’s session above the intersection of the 50 and 200 day moving averages. The close was near the high of the day and is retesting channel resistance. The stochastics oscillator and the aroon indicator have both made bullish crossovers reflecting the shift in price momentum and trend direction. The accumulation distribution line is above its signal average and the Chaikin oscillator, an average of the 3 and 10 period averages of Chaikin money flow, is above its center line. The stock is a buy after an upper candle close above pattern resistance using a trailing percentage stop. This article appeared on TheStreet.com this morning. Here are two retail sector articles that were published on TheStreet.com earlier in the week– Ralph Lauren (RL), DSW (DSW), and Michael Kors (KORS) look like potential buys but Tiffany (TIF) appears poised for a pullback. Three retail longs and an upscale short. 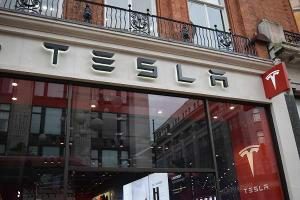 Here’s my technical take on the potential pullback levels in Apple AAPL and Tesla TSLA shares, previously published on TheStreet.com this week.